Lignans are plant-based phytoestrogens with both estrogenic and anti-estrogenic properties that may be important for breast carcinogenesis. 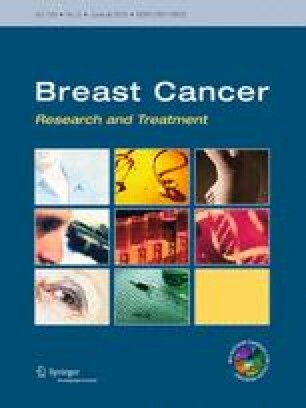 Retrospective studies have observed decreased breast cancer risk associated with high circulating enterolactone concentrations, a biomarker of lignan intake, but results from prospective studies are conflicting. To prospectively examine this association, we measured plasma enterolactone levels in 802 breast cancer cases and 802 matched controls nested among predominantly premenopausal women in the Nurses’ Health Study II cohort. We used conditional logistic regression and polytomous logistic regression models, adjusting for known breast cancer risk factors, to calculate relative risks (RR) and 95 % confidence intervals (CI). Compared to women with enterolactone concentrations ≤4 nmol/L, the multivariate-adjusted RRs for breast cancer were 1.18 (95 % CI 0.86–1.62), 0.91 (95 % CI 0.66–1.25), and 0.96 (95 % CI 0.70–1.33) for women with enterolactone levels in the second to the fourth quartiles, respectively; P trend = 0.60. Results were similar across tumors defined by estrogen and progesterone receptor status. Among premenopausal women with follicular estradiol levels below the median (<47 pg/mL), women in the highest category of enterolactone levels had a 51 % lower breast cancer risk compared to those in the lowest category (95 % CI 0.27–0.91); P trend = 0.02. No association was observed among women with high-follicular estradiol levels (≥47 pg/mL), (comparable RR = 1.39, 95 % CI 0.73–2.65; P interaction = 0.02). We did not observe an overall association between plasma enterolactone and breast cancer risk in a large nested case–control study of US women. However, a significant inverse association was observed among premenopausal women with low-follicular estradiol levels, suggesting that enterolactone may be important in a low-estrogen environment. This should be confirmed in future studies. The online version of this article (doi: 10.1007/s10549-013-2586-y) contains supplementary material, which is available to authorized users. This project was supported by the National Institutes of Health (NIH) R01 CA67272, R01 CA50385, and P30 CA71789. J.X. is supported by scholarships from Harvard University. M.S.R. is supported by the NIH T32 CA09001. The authors thank participants of the Nurses’ Health Study II for their longstanding contributions and support to this study. Laurie Custer, University of Hawai’i Cancer Center, is acknowledged for her skillful performance of the LCMS assay. The authors also thank the following state cancer registries for their help: AL, AZ, AR, CA, CO, CT, DE, FL, GA, ID, IL, IN, IA, KY, LA, ME, MD, MA, MI, NE, NH, NJ, NY, NC, ND, OH, OK, OR, PA, RI, SC, TN, TX, VA, WA, and WY.